World Music Festival, Do Not Miss It! You are here:Home » Promotion / Events » World Music Festival, Do Not Miss It! Mark your calendar & make sure you're available on 20th & 21st September 2013! 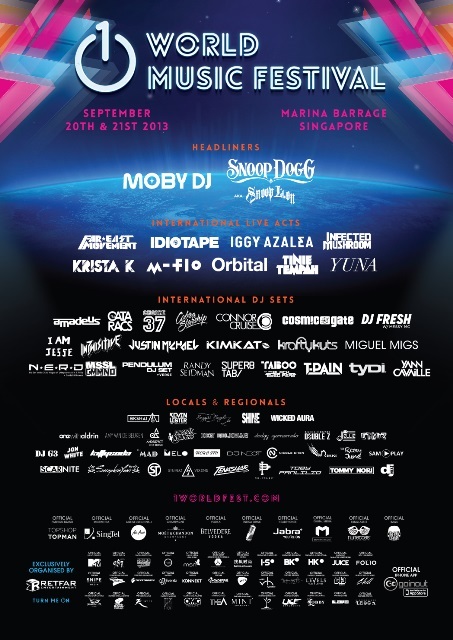 Marina Barrage is going to hold the 1 World Music Festival, 'the region’s first ever large scale musical extravaganza featuring the hottest A-list music artists today’! Snoop Dogg AKA Snoop Lion & Moby, & international megastars N*E*R*D, Cosmic Gate, Far East Movement, Iggy Azalea, Infected Mushroom, Tinie Tempah, The Cataracs, Cobra Starship, Taboo, Pendulum (DJ Set) + Verse & Yuna – just a few names that will make your evening unforgettable! ‘Intent on pushing the limits of entertainment to wow its audience, the Festival is working with the top names in the industry to feature top-of-the-line stage lights, superior video production & captivating visuals. Top-notch choreography & dancers will accompany the artists, making for a seamless music event. Topshop Topman will be part of the high profile music festival as its Official Fashion Partner this Autumn/Winter 2013, dressing the artistes backstage as well as offering a branded print space with limited edition festival totes & tees on site. Hurry up, tickets are selling very fast! Thanks a lot to Ana Shell for the information! Can’t wait to see her report about this event so that I can share with you. I’m glad to be among the first to know about the event & getting the invitation too. Isn't that awesome? Obviously I'm not in the music industry. Haha! I know none of the list. However, Topshop - yes, I know this brand name - Jeans/T-shirts all very nice. DS, hahaha! You're so cute! Reana, that's too bad else you can have fun here! thanks for the info... cool! i think it will be crowded. cquek, I'm sure it'll be packed! Wish I can take time off and come over. Maybe another time. Ken, it surely doesn't hurt! Hahaha! Sounds like a spectacular event! You are always in the loop, my friend! Liz, I'm sure there'll be a huge turnout! Crowded places are unsuitable for me. .
Shirley, I saw "World Music Festival" in my inbox and you KNOW I had to check it out. :) Sounds like they've lined up some major acts and are planning a huge, fun time for all. MM, have a wonderful week! is this part of the F1 concert as well as I know the F1 is during the end of the week right? wahh...but since SG is small and they organised the one and only night race leh..summore ticket sold out d..haha..
Hong, looks like you're a huge fan of F! !